Discussions Magazine Music Blog: An EXCLUSIVE Interview with NEIL GAIMAN! An EXCLUSIVE Interview with NEIL GAIMAN! On the surface, they come from two seemingly different worlds. 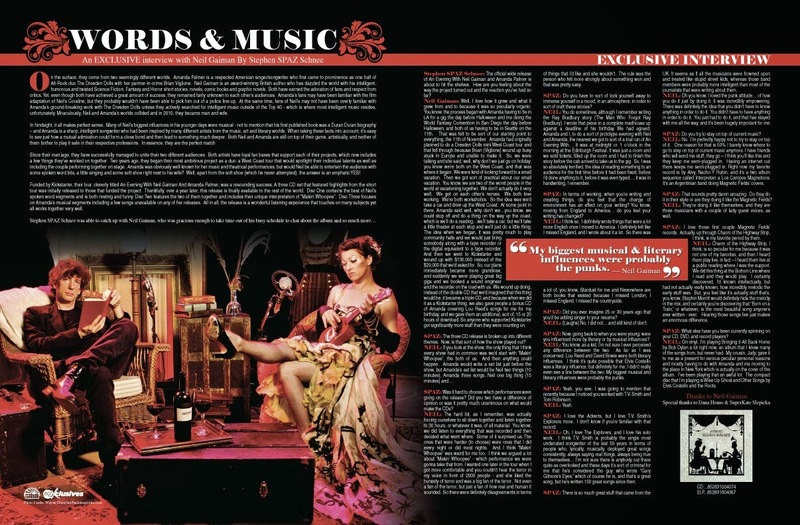 Amanda Palmer is a respected American singer/songwriter who first came to prominence as one half of Alt-Rock duo The Dresden Dolls with her partner-in-crime Brian Viglione. Neil Gaiman is an award-winning British author who has dazzled the world with his intelligent, humorous and twisted Science Fiction, Fantasy and Horror short stories, novels, comic books and graphic novels. Both have earned the adoration of fans and respect from critics. Yet, even though both have achieved a great amount of success, they remained fairly unknown to each other’s audiences. Amanda’s fans may have been familiar with the film adaptation of Neil’s Coraline, but they probably wouldn’t have been able to pick him out of a police line-up. At the same time, fans of Neil’s may not have been overly familiar with Amanda’s ground-breaking work with The Dresden Dolls unless they actively searched for intelligent music outside of the Top 40 - which is where most intelligent music resides, unfortunately. Miraculously, Neil and Amanda’s worlds collided and in 2010, they became man and wife. Since their marriage, they have successfully managed to unite their two different audiences. Both artists have loyal fan bases that support each of their projects, which now includes a few things they have worked on together. Two years ago, they began their most ambitious project as a duo: a West Coast tour that would spotlight their individual talents as well as including the couple performing together on stage. Amanda was obviously well-known for her music and theatrical performances, but would Neil be able to entertain the audience with some spoken word bits, a little singing and some soft shoe right next to his wife? Well, apart from the soft shoe (which he never attempted), the answer is an emphatic YES! 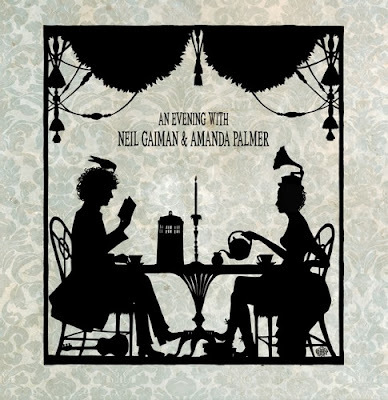 Funded by Kickstarter, their tour, cleverly titled An Evening With Neil Gaiman And Amanda Palmer, was a resounding success. A three CD set that featured highlights from the short tour was initially released to those that funded the project. Thankfully, over a year later, this release is finally available to the rest of the world. Disc One contains the best of Neil’s spoken word segments and is both riveting and funny. Disc Two features the two of them together and includes their unique interpretation of “Makin’ Whoopee”. 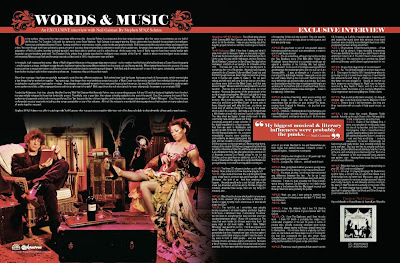 Disc Three focuses on Amanda’s musical segments including a few songs unavailable on any of her releases. All in all, the release is a wonderful listening experience that touches on many subjects yet all works together very well. STEPHEN SPAZ SCHNEE: The official wide release of An Evening With Neil Gaiman and Amanda Palmer is about to hit the shelves. How are you feeling about the way the project turned out and the reaction you’ve had so far? NEIL GAIMAN: Well, I love how it grew and what it grew from and to because it was so peculiarly organic. You know, the process began with Amanda having to be in LA for a gig the day before Halloween and me doing the World Fantasy Convention in San Diego the day before Halloween, and both of us having to be in Seattle on the 11th. That was felt to be sort of our starting point to everything, the 11th of November. Amanda had originally planned to do a Dresden Dolls mini West Coast tour and that fell through because Brian (Viglione) wound up busy stuck in Europe and unable to make it. So, we were talking and she said, well, why don’t we just go on holiday, you know we’re both on the West Coast, and that was where it began. We were kind of looking forward to a small vacation. Then we got sort of practical about our small vacation. You know, we are two of the worst people in the world at vacationing together. We don’t actually do it very well. We get on each other’s nerves. We both love working. We’re both workaholics. So the idea was we’d take a car and drive up the West Coast. At some point in there, Amanda said well, why don’t we…you know, we could stop off and do a thing on the way up the coast, which is we’ll do a reading…we’ll take a car, but we’ll take a little theater at each stop and we’ll just do a little thing. So that sounded really fun. Once that had been suggested, then it was only a very short skip to if we’re gonna do it, we should probably record it just so that we got it recorded because it might be kind of….and from there it was a weird little skip to – well, you know there’s this thing called Kickstarter. Let’s see if we can actually Kickstart….you know, the idea when we began, it was pretty much to play community halls and the idea was we would just bring somebody along with a tape recorder or the digital equivalent to a tape recorder. And then we went to Kickstarter and wound up with $130,000 instead of the $29,000 that we’d asked for. So, our plans immediately became more grandiose, and suddenly we were playing great big gigs and we booked a sound engineer and the recorder on the road with us. We wound up doing, instead of the double CD that we’d imagined that this thing would be, it became a triple CD, and because when we did it as a Kickstarter thing, we also gave people a bonus CD of Amanda covering Lou Reed’s songs for me for my birthday, and we gave them an additional, sort of, 15 or 20 hours of download. So anyone who supported the Kickstarter got significantly more stuff than they were counting on. Having done that, of course, then we sort of thought that we’d actually done what we set out to. Generally speaking, I believe it’s so weird and organic. None of it was actually planned. If Brian had been available for Amanda, I would never have done this, and I’m still glad we did and I was glad we did for a bunch of reasons including how interesting it was for both of us to introduce our fans to each other. SPAZ: The three CD release is broken up into different themes. Now, is that sort of how the show played out? NEIL: If you look at the show, the only thing that I think every show had in common was we’d start with “Makin’ Whoopee”, the both of us. And then anything could happen. Amanda would write a set list just before the show, but Amanda’s set list would be Neil two things (10 minutes), Amanda three songs, Neil one big thing (15 minutes) and…. SPAZ: Oh, I see. This was not like this conceptual thing where you come out alone for half an hour, then you’d both do something together, then finally, she would close with her set? NEIL: The disc with both of us gives you more of a flavor of what things were like. Really, what you need to do, I think, is download or rip all three CDs and just press random, and that will actually give you the flavor of the night. SPAZ: Was it hard to choose which performances were going on the release? Did you two have a difference of opinion or was it pretty much unanimous on what would make the CDs? NEIL: Thank you. That was one that I did one night and it was just one of those things, like a little fun to read that. I think I read it in Portland just because Portland was the home of Laika (the animation company) where Coraline was made… and actually, listening to that, I went, “This is great.” I want this. The Ray Bradbury one was wonderful. The ones that were harder (to choose) were ones that I did every night or did most nights. And I think “Makin’ Whoopee” was weird for me too. I think we argued a lot about “Makin’ Whoopee”… which performance we were gonna take that from. I wanted one later in the tour when I got more comfortable and you couldn’t hear the terror in my voice in front of 2000 people - and she liked the honesty of terror and was a big fan of the terror. Not even a fan of the terror, but just a fan of how real and human it sounded. So there were definitely disagreements in terms of things that I’d like and she wouldn’t. The rule was the person who felt more strongly about something won and that was pretty easy. The hardest thing actually, I think, to put in was to decide on was all the Q&As. There were so many great questions and great answers. SPAZ: The spoken word disc is just this amazing trip through these different moods and atmospheres, and it sort of transports the listener into a world that is completely different to their own. Now, in order to create these different characters, these different ideas, these different stories, do you have to sort of lock yourself away to immerse yourself in a mood, in an atmosphere, in order to sort of craft these stories? NEIL: You do sometimes, although I remember writing the Ray Bradbury story (The Man Who Forgot Ray Bradbury)… I wrote that piece in a complete madhouse up against a deadline of his birthday. Then we agreed, Amanda and I, to do a sort of prototype Evening With Neil and Amanda, the nearest we got to sort of a trial evening of…at midnight or 1 o’clock in the morning at the Edinburgh Festival. It was just a room at the festival and we sold tickets, filled up the room with these 30 people, whatever it was that fit in there, and I had to finish the story before the cab arrived to take us to the gig. So, I was so absolutely terrified, the idea of reading something to an audience for the first time before it had been fixed, before I’d done anything to it, before it was even typed…. it was in handwriting, I remember. SPAZ: And you can read your own handwriting? NEIL: I could read my own handwriting, although if I were completely honest, I would have to confess that I actually threw up out of the window… stage fright. It’s so funny – Amanda does not have stage fright. Amanda has not had stage fright for probably 15 years. I, on the other hand, am a writer, and I have stage fright. So, it’s been a very different experience for me than it is for her. SPAZ: In terms of working, do you feel that the change of environment has an effect on your writing. You know, going from England to America. Do you feel your writing has changed? NEIL: I think so. I definitely wrote things that were a lot more English once I moved to America. I definitely felt like I missed England, and I wrote about it a lot. So there was a lot of, you know, Stardust for me and Neverwhere are both books that existed because I missed London, I missed England, I missed the countryside. SPAZ: Do you go back often to visit? NEIL: Nowhere near as often as I should. SPAZ: On this record, is there a particular favorite track or moment that you think that maybe best represents this, that maybe you’d present to somebody who is unfamiliar with both you and Amanda? SPAZ: Did you ever imagine 25 or 30 years ago that you’d be adding singer to your resume? NEIL: (Laughs) No, I did not… and still kind of don’t. SPAZ: Now, going back to when you were young, were you influenced more by literary or by musical influences? NEIL: You know, as a kid, I’m not sure I ever perceived any difference between the two. As far as I was concerned, Lou Reed and David Bowie were both literary influences. I think it’s quite possible that Elvis Costello was a literary influence, but definitely for me, I didn’t really even see a line between the two. My biggest musical influences, literary influences were probably the punks. SPAZ: Yeah, you see, I was going to mention that recently because I noticed you worked with T.V. Smith and Tom Robinson. SPAZ: I love The Adverts (T.V. Smith's legendary Punk band), but I love T.V. Smith’s Explorers more. I don’t know if you’re familiar with that record. NEIL: Oh, I love The Explorers, and I love his solo work. I think T.V. Smith is probably the single most underrated songwriter of the last 50 years in terms of people who, lyrically, musically, deployed great songs consistently, always saying real things, always being true to themselves… I’m not sure there is anybody out there quite as overlooked and these days it’s sort of criminal for me that he’s considered the guy who wrote “Gary Gilmore’s Eyes,” which of course he is, and that’s a great song, but he’s written 150 great songs since then. SPAZ: I respect him for not doing an Adverts reunion tour, but at the same time I’m thinking is this the only time that he’ll be able to get that recognition? You know what I mean? It’s like I have to remind people who T.V. Smith is. “Oh that guy, okay.. yeah, yeah, the Adverts..” but I’m wondering why he has never buckled in and done an Adverts tour. NEIL: The funny thing for me about the Adverts is I just did some interview in the UK where they were asking what my favorite albums were, and I actually included Cast of Thousands on my top 10 favorite albums because it was such an interesting case of somebody making exactly the right album 18 months early, and he made it and nobody knew what the hell it was or how it applied, and now 40 years later you can listen to Cast of Thousands and go, “That is an amazing album.” Musically it is absolutely what it ought to be. At the time, people wanted three fast chords with some shouty stuff and it was kicked to the curb so hard. SPAZ: There is so much great stuff that came from the UK. It seems as if all the musicians were frowned upon and treated like stupid street kids, whereas those band members were probably more intelligent than most of the journalists that were writing about them. NEIL: Oh you know, I loved the punk attitude… of how you do it just by doing it. It was incredibly empowering. There was definitely the idea that you didn’t have to know anything in order to do it. You didn’t have to have anything in order to do it. You just had to do it, and that has stayed with me all the way, and it’s been hugely important for me. SPAZ: Do you try to stay on top of current music? NEIL: No. I’m perfectly happy not to try to stay on top of it. One reason for that is 50% I barely know where to go to stay on top of current music anymore. I have friends who will send me stuff, they go – I think you’ll like this and they keep me semi-plugged in. Having an internet out there keeps me semi-plugged in. Right now my favorite record is by Alvy, Nacho Y Rubin, and it’s a two album sequence called Interpretan a Los Campos Magneticos. It’s an Argentinian band doing Magnetic Fields’ covers. SPAZ: That sounds pretty damn amazing. Do they do it in their style or are they doing it like the Magnetic Fields? NEIL: They’re doing it like themselves, and they are three musicians with a couple of lady guest voices, as well. SPAZ: I love those first couple Magnetic Fields’ records. Actually, up through Charm of the Highway Strip, I think, is my favorite period by them. NEIL: Charm of the Highway Strip, I think, is so peculiar for me because it was not one of my favorites, and then I heard them play live, in fact – I heard them live at a public reading where I was the support. We did this thing at the Bottom Line where I read and they would play. I certainly discovered, I’d known intellectually, but had not actually really known, how incredibly melodic the early stuff was. But, you feel like it’s actually stuff that’s, you know, Stephin Merritt would definitely hide the melody in the mix, and certainly you’re discovering that “Born on a Train,” or whatever, is the most beautiful song anyone’s ever written - ever. Hearing those songs live just makes an enormous difference. SPAZ: What else have you been currently spinning on your CD, DVD, and record players? NEIL: On vinyl, I’m playing Bringing it All Back Home by Bob Dylan a lot right now, an album that I knew many of the songs from, but never had. My cousin, Judy, gave it to me as a present for various peculiar personal reasons and mostly having to do with Amanda and me moving to the place in New York which is actually on the cover of the album. I’ve been playing that an awful lot. The compact disc that I’m playing is Wise Up Ghost and Other Songs by Elvis Costello and the Roots.